Behold the creepy face of Thor's next foe, (what we're still guessing is) the Dark Elves of Svartalfheim. So far we've only seen glimpses of the next Marvel villain from the set of Thor: The Dark World. 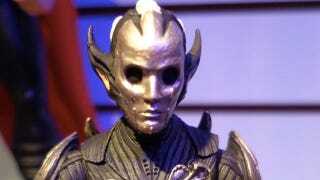 But thanks to Hasbro's presentation at Toy Fair 2013, it appears that we've now got a face full of evil Elf. Granted, the Elves have yet to be confirmed for the Thor sequel, but just look at these guys. They look like elves, right down to their banging braids. These photos from the set of Thor 2 may show the faces of the Dark Elves! Do these Thor 2 set photos reveal the Land of Dark Elves? Check out the new Thor: The Dark World toy line featuring a slightly new look for Loki, a new cape for Thor and the face of the enemy they must defeat. This is but a preview of Hasbro's Thor: The Dark World movie toy line, which will not be in stores until closer to the Marvel movie release date, November 8th, 2013.